I hit my favorite church rummage sale this morning, and man did I score big. 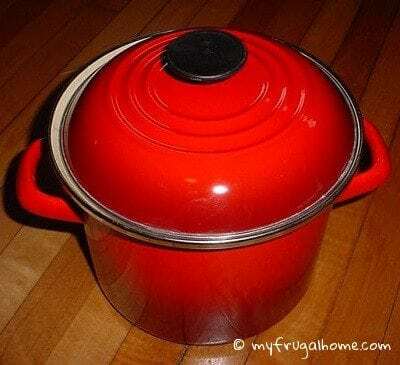 I scooped up this Le Creuset enameled-steel pot for just a buck! Can’t wait to see what they’ll have next month. ← Do You Have a Sock Box? Wow!!!! What a great find! I could be quite jealous if I wasn’t a Christian! LOL Great shopping! We don’t have much going on right now….look forward to the church sales for sure! Love the find! I love Le Creuset! I haven’t had any luck finding any pieces at yardsales or through Craigslist myself – this will push me to keep looking. P.s. – longtime follower on Frugal Living on FB, but as you can see, I haven’t clicked on the links in a while. I had no idea you had your web page. I will definitely add you to my feed now!